Roger Lloyd Pack, whose father Charles played Professor Marks in the series, joins Anneke on a stroll through some of the London locations used in Strange Report and talks to her about the series, her career, and life in London in the swinging sixties. From his home in Portland, Oregon, Kaz Garas recalls his time in England in 1968 working on Strange Report. Generic and episode-specific trailers, textless background material, clean Main and End titles, Commercial Break Bumpers, a compilation of textless footage and rushes, and the US edits for Skeleton - Let Sleeping Heroes Lie. A visual demonstration of the techniques used to produce possibly the best ever pictures of an archive television series. 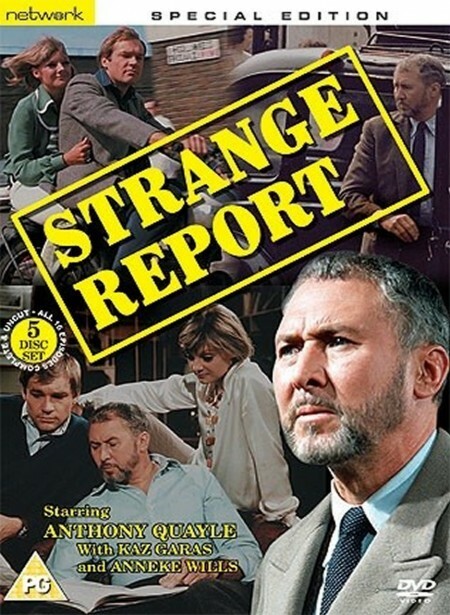 A vast selection of mostly unseen ITC stills set to Roger Webbís original music score for Strange Report (from the recently discovered studio tapes), merchandise and Kaz Garasí On-Set Gallery ñ candid photographs taken during filming by the series co-star. Original script PDFs for Heart - No Choice for the Donor and Skeleton - Let Sleeping Heroes Lie, alongside both the ITC and NBC Strange Report promotional brochures.